A 25-year-old Fort Bragg soldier who became ill a year ago in Afghanistan died Wednesday from an undetermined cause, an Army official said. Specialist David Daniel Iszkiewicz, shown here with his wife, Nicole, died Wednesday. The soldier, Specialist David Daniel Iszkiewicz, deployed to Afghanistan in December 2001, said Major Gary Tallman, a Fort Bragg spokesman. He left Kandahar on Jan. 24, 2002, to return to Fort Bragg. The illness grew progressively worse. Iszkiewicz was from Allegany, New York, and served with the 108th Military Police Company. He died at his home off Rosehill Road near Country Club Drive. Tallman said the Army is investigating Iszkiewicz's death. Iszkiewicz's family did not talk about the death, citing the investigation. His wife, Nicole, said her husband remained strong over the past year. Soldiers who worked with Iszkiewicz said they lost a good friend. "He was trustworthy; he was honest," Specialist Tony Arterburn said. "He was fair in all weather. He was there, and he would make it through anything. "He did the best he could with the given situation," Arterburn said. Nicole Iszkiewicz said her husband, who went by the nickname Iszy, loved his law-enforcement job - working cases, investigating, being on the road. 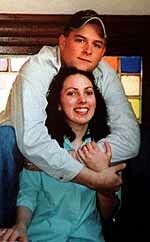 They met in March 2001 and went on a first date four months later. "We ate dinner and set a date for the next day," she said, "and we never spent another day apart until his deployment to Afghanistan. We never got sick of each other." Iszkiewicz deployed two days before Christmas. Once in Afghanistan, he waited hours to make 10-minute calls home. "He knew what he was up against," she said. "He joined so he could provide his service for the country." On February 2, 2002, the day he arrived home, he proposed. They married four months later. Iszkiewicz continued to work at least some of the time over the past year, but his duties were confined more to desk jobs. He saw doctors on Fort Bragg and in Washington. "He tried to stay focused on things that made him happy - be the best husband he could be, really," his wife said. Iszkiewicz's father, Daniel Iszkiewicz, said he had looked forward to grandchildren. "I was just beginning to have a strong relationship with him,'' he said, in tears. "He was the closest friend I had." Tallman said no one else from Iszkiewicz's unit "got sick like this." The Army stresses to soldiers potential health hazards during deployments. "Every soldier is so important," he said. "To have the willingness to do their duty and deploy, we treasure every one of them. It's very sad when something like this happens." Iszkiewicz received a NATO medal for a Kosovo deployment and a Kosovo campaign medal. A viewing is scheduled tonight from 7 to 9 at Jernigan-Warren Funeral Home chapel on Ramsey Street. A funeral is 2 p.m. Sunday at Jernigan-Warren, and a memorial service is Monday at 4 p.m. at the Main Post Chapel on Fort Bragg. Iszkiewicz will be buried at Arlington National Cemetery with military honors.